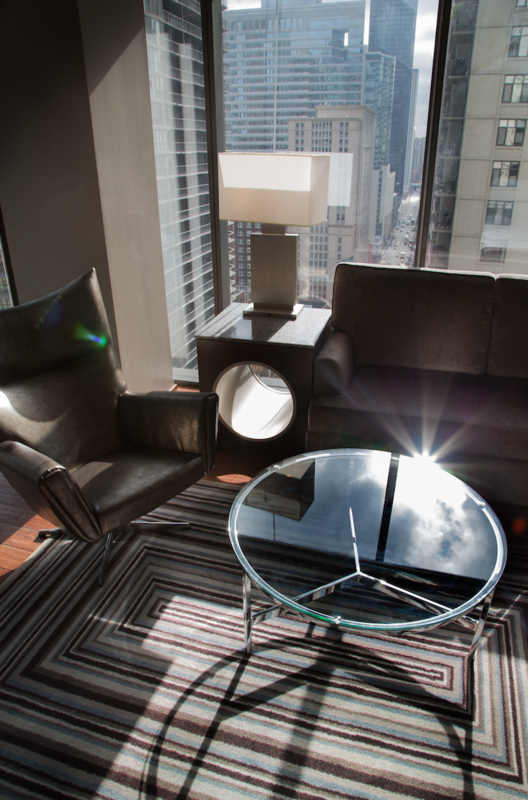 After a recent renovation, this River North boutique property is quickly becoming a destination for locals and travelers alike thanks to buzzworthy dining at innovative rooftop lounge Apogee and hip, modern accommodations. It's worth calling instead of booking online in order to take advantage of personalized packages like a helicopter ride or Wrigley Field tour for an extra Chicago experience. Industrial chic meets modern luxury with spacious rooms boasting impressive views from all angles of Chicago's River North neighborhood. Despite concrete walls, rooms are impressively serene thanks to padding in the hallways to reduce noise, blackout shades, and plush beds are outfitted with 1000 thread count Egyptian cotton. Small perks include Bowers and Wilkens sound systems, iPad concierges, in-room yoga mats, and complimentary umbrellas just in case. 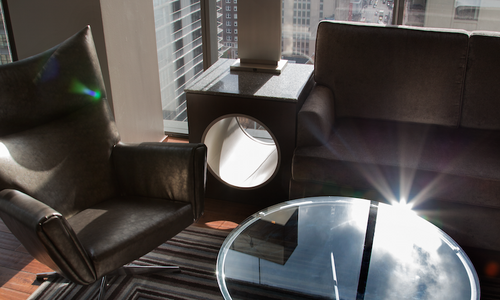 YOU SHOULD KNOW For the best views, corner king rooms are the most coveted with half-panoramic windows overlooking the Chicago Theater District. Additionally, all rooms offer private wine reserve with prices comparable to off-site, so feel free to let loose in your room. White and modern, bathrooms are equipped with Lather products, Egyptian cotton towels, and quality vanity lighting for primping. Standing showers have glass open into the room, which can be closed by a partition of gold curtains for privacy. If you value space, it's worth upgrading to a suite for apartment-like accommodations that an enormous two-seat stone standing shower with multiple showerheads for a spa-like experience. 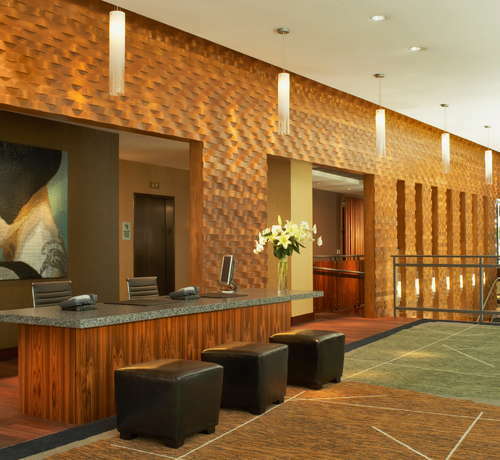 Head up to the second floor to find an open-floor concierge desk decked out with reclaimed wood and modern art extending into the Leviathan bar and Portsmith restaurant. YOU SHOULD KNOW As you check in, take note of the interactive kaleidoscope installation art. A suspended bell in the lobby stair was custom made in Tibet, which rang only once when the hotel opened as a sign of good luck. True to the property's name, the award-winning spa is definitely worth noting. Five treatment rooms offer tranquil services including aromatherapy massage with Zents products, customized facials, and mani-pedis. The recently renovated 24-hour fitness room has state-of-the-art television cardio machines and a designer Kinesis Technogym strength training system. YOU SHOULD KNOW It's worth hitting up the locker room after your work out to indulge in the steam room and showers equipped with 10 customizable heads. Portsmith, an upscale seafood concept operated by local restaurant group The Fifty/50, is expected to open this summer, which will inventive coastal fare and also serve the property's in-room dining program. Apogee is the new rooftop lounge buzzing around town, known for Instagram-worthy over-the-top cocktails with stunning custom hand blown glassware and stellar city views. Draped in Art Deco details like white marble, brass accents, and blue velvet couches with wood panels, expect a more sophisticated bar scene. Heaters and a fire pit keep the 50-seat outdoor patio going year-round. Leviathan, a mythical seafaring concept bar, is expected to open this summer on the property's ground floor with rivaling inventive cocktails inspired by the sea. YOU SHOULD KNOW Plan accordingly: the bar is only open Thursday to Sunday and cocktails are larger format for sharing—so bring a few friends. It's best to make reservations, but the bar also welcomes walk-ins. It's a 4-minute walk in either direction to the Chicago or Grand 'L' red line subway stops, and one block away from the 36 Broadway bus stop. Taxis are easily accessible off State Street, or by ordering a ride-hailing app like Lyft. For a taste of Chicago's iconic hot dogs and pizza, it's only a short walk to Portillo's Hot Dogs (5-minute walk) and Pizzeria Uno's (4-minute walk). On the lighter side, health-centric spots True Food Kitchen and Sweetgreen are both within a one-block radius. River North is known for bar hopping. Iconic cocktail lounge The Redhead Piano Bar is just around the corner (2-minute walk), along with wine bars Pops for Champagne and Quartino. Head down to Hubbard Street (11-minute walk) for a slew of options at Three Dots & A Dash, Bub City, Hub 51, and Hubbard Inn. Nestled in a few blocks away from the Mag Mile, it's easy to overlook this gem hiding in plain sight. 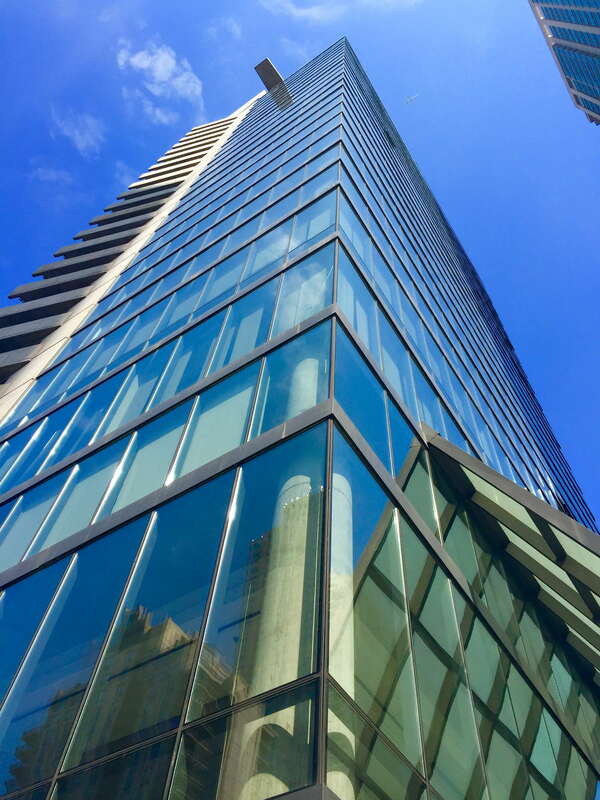 Business travelers particularly benefit from easy access to public transit, accessible tech-friendly connectivity, and quiet accommodations not too far from the party happening at its three restaurants and bars. The property manages to seamlessly combine a thriving local bar scene and a tranquil spa in the same space without infringing too hard on either experience, making this a solid bet for adventurous solo and couple travelers.